Who was at the meeting, who wasn't at the meeting and who else should the Cubans meet with? 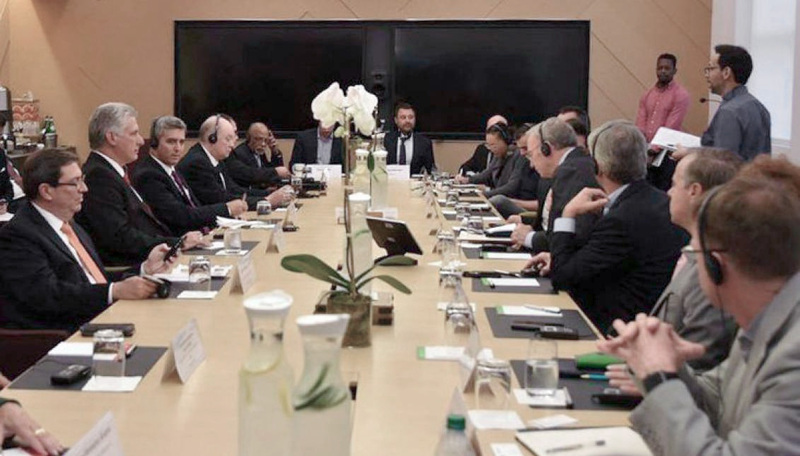 While Cuban president Miguel Díaz-Canel was in New York to address the United Nations, he met with members of Congress and executives from the agriculture, travel and information and communication technology (ICT) industries. The ICT meeting was at Google's New York office and ten other companies attended. In addition to Díaz-Canel the Cuban ministers of Foreign Affairs, Foreign Trade and Foreign Investment and Communications were at the meeting. Since the only report I have seen of the meeting was a short article in Granma (Spanish), I don't know what was discussed or decided — I can only guess. The following is a list of the companies at the meeting with a little speculation. Google: Perhaps they talked about their latest, rumored, unspecified deal to expand Internet access in Cuba. Another possibility would be bringing their African broadband infrastructure company CSquared (begun as Google Project Link) to Cuba. VaynerMedia: I'd not heard of them, but they seem to be an Internet-savvy PR agency that has done work for many companies, including Google. Perhaps they would like to promote Cuban tourism, ICT or biotech companies or Cuban offshore development services. Or, they might be interested in a Cuban production facility. (Google has production spaces in ten cities — how about Havana)? Connectify: They are already in Cuba — their software is widely used by Cubans who share connections at WiFi hotspots. Mapbox: I bet this map of Cuba uses their geographic information system tools. Perhaps they will develop something for the Cuban tourism industry? McKinsey and Company: They might be looking for a strategic ICT planning engagement. (Others will work for less — see below). Virgin Group: This is a capital investment company with experience in travel, telecommunication, media and other areas where Cuba has both needs and assets — might they invest in Cuba, S. A.? AirBnB: They are already doing a robust business in Cuba by providing a good deal for both Cuban renters and tourists. (I wonder whether Trump's clamp-down on tourism has hurt them). Revolution: I assume this is Revolution Ventures. If so, they may be interested in investing in Cuban startups. Twitter: Cubans already use Twitter — what more can they be thinking of? Microsoft: Pirated Microsoft software is common in Cuba — might they be talking about some sort of licensing or royalty agreement in return for support? (I recall long ago visiting a government-run storefront where you could bring floppy disks and order copies of all major US software, including Microsoft's). Microsoft might also be looking for tech employees, offshoring or opening a Cuban development center. Bloomberg: Did they attend as financially-oriented journalists? Cresta AI: might they be looking for developers or to build intelligent applications? Those were the attendees. Who not there? I was relieved to notice that none of the large US wireless or wireline ISPs were at the meeting. I would not want to wish my experience with Verizon and Spectrum on Cubans. I was surprised that Cisco did not participate. Cisco supplied Cuban networking infrastructure in the early days of the Internet, but Huawei has replaced them today. Still, Cisco is the only US ICT company I can think of besides Google that has made the effort to build relationships in today's Cuba, enabling them to begin offering their Cisco Networking Academy training at the Universidad de Ciencias Informáticas. Cisco-trained students may be willing to purchase their equipment once in the workforce. I was also surprised that no one from ETECSA was there, although there may have been ETECSA representatives seated in the periphery of the room behind the conference table as is often the case in such meetings. Finally, who was not there that I would advise Díaz-Canel and Cuban ICT decision makers meet with? Organizations like the International Telecommunications Union, the United Nations Development Program and the Internet Society, which have expertise in networking in developing nations, national broadband planning, regulation, and policy. Cuba needs to consider next-generation infrastructure ownership and regulatory alternatives as well as next-generation technology. ICT ministries of nations like Singapore's Ministry of Communications and Information, which has been an ICT planning leader for many years. Municipal networking experts like The Baller Group and a representative of Stockholm's successful municipal network AB Stokab. Representatives of citizen networks like Havana's SNET and Spain's Guifi.net. Cubans are well educated and have a culture and tradition of innovation and self-sufficiency (thanks in part to the US embargo). SNET (and El Paquete Semanal) are providing much of what people use the Internet for. Might ETECSA look upon these organizations as collaborators (or customers) rather than extra-legal competitors? Consultants and consulting firms with deep expertise in networking in developing nations like the Network Startup Resource Center, the Association for Progressive Communication (which provided UUCP connectivity to Cuba in the pre-Internet days) or Steve Song in Africa. People from companies working on future technologies which will not be available for a number of years, for example, representatives of low-Earth satellite companies like OneWeb and SpaceX or engineers working on Ericsson's long-run 5G mobile products. To keep the technology and policy experts honest, I would also include some people concerned with the social impact of the Internet, for example, Yuval Noah Harari, Zeynep Tufekci and Elon Musk. Don't get me wrong — I think meeting and establishing relationships with companies from the US and other nations is a positive step for the Cubans, but I hope they broaden their contacts and meet with an eclectic group of people and organizations thinking about long-range planning for leapfrogging to future technologies as well as stopgap interim measures like WiFi hotspots, home DSL and 3 and 4G mobile connectivity. One can imagine a most interesting Cuban Internet-advisory committee. For a Spanish language translation of this post, click here. Local Time: Wednesday, April 24, 2019 09:30 PM PDT – Page Load: 0.3333 Sec.